In February 2011 the first representatives for MAF Learning Technologies (MAFLT) began work in Arnhem Land, which is home to the Yolngu Aboriginal people. The need for equipping and empowering the local believers was very clear from the start, as there have been minimal Bible and Christian resources in their languages to reach the unreached or meet the needs of the young and old Yolngu believers. Before arriving in Arnhem Land, MAFLT representatives were aware of an unfinished project - the Good News in Gumatj DVD. This DVD project was started three years ago, using an original GRN (Global Recording Networks) audio track recorded in the 80's with the voices of two ladies, Mutilnga and Gulumbu. The Gumatj language audio track was 2 hours long and it re-told the Good News gospel story and how to live a Christian life. Accompanying the Good News audio track was a 40-page colour picture booklet that had been put together by GRN, for use with any language. 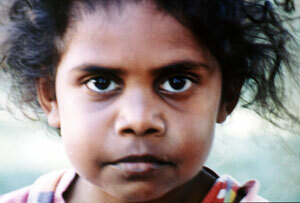 After an initial 40-picture DVD was produced and shown to the Yolngu, they requested more pictures be included to explain the concepts of the story better; so with the help of the MAFLT department in Arnhem Land, the original 40 pictures eventually expanded to 900+ digital pictures to reflect the story being told in the audio narrative. Many months later the project was produced in DVD format and then converted into mobile video format as well, with files small enough that they can be put onto a MicroSD card and shared easily via Bluetooth. The DVD is being used for ministry outreach events and is also handed out to Yolngu people. For the MAFLT team it was a special moment in July 2011 when the DVD was first shown and distributed at a ministry outreach night. It was exciting to see people walking around afterwards with the Good News in Gumatj on their mobile phones. MAFLT wants to thank all those who have put time and energy into this project. This Good News DVD is a beneficial resource for evangelism and discipleship amongst the Yolngu Aboriginal people in East Arnhem Land. These 900+ pictures have now been made available for producing similar projects in other languages. Please contact GRN or MAF Learning Technologies for permission to use this resource.